Packers starting RT Don Barclay missed his second straight practice on Thursday with a knee injury, but Head Coach Mike McCarthy said he was going to give Barclay every opportunity to get himself healthy enough to play on Sunday. If Barclay is unable to play, the Packers’ options would be to start Marshall Newhouse — who has filled in at RT in each of the last two games when Barclay had to shift over to RG — or to give Derek Sherrod his first game action since Dec. 2011. 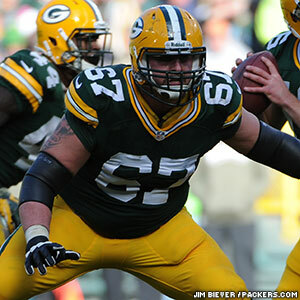 Also on the offensive line, C Evan Dietrich-Smith was a limited participant in practice for the second straight day. Thursday’s practice was in pads and Dietrich-Smith was not held out, so that bodes well for his chances to play. McCarthy also said CB Casey Hayward (hamstring) will be out “multiple weeks.” On the defensive line, Johnny Jolly (groin) sat out for the second straight day, and Ryan Pickett (knee) was limited.